Ricardo Vasconcelos relished the first day of Northants’ clash with Middlesex as the South African batsman registered a superb century. It was a first County ton for Vasconcelos, who moved to Northants prior to the start of this season. The 20-year-old, making his fifth appearance for the club, equalled his career-best 140, occupying the crease for 210 balls. It helped Northants to make 332 for eight, having been sent in on a green-tinged pitch where movement with the ball was evident all day. And Vasconcelos, who took full advantage of a terrible dropped catch by Eoin Morgan at first slip when on 28, said: “It was nice to get my first hundred for the county and it’s a good feeling. “The ball moved around pretty much the whole day, there were a lot of plays and misses and I was dropped but you have to take a few moments of luck. “My plan was every time we lost a wicket to try to get the next guy in and try to get the partnership to 20 before increasing the scoring rate and we didn’t lose any quick wickets until after tea. Ben Duckett was the only single-figure score of the Northants top-order as James Harris sent one through his gate to bowl the left-hander for seven in the sixth over of the morning. But Middlesex were not as sharp in the field as they would have liked having not contested the toss. Luke Procter and Vasconcelos added 59 for the second wicket before Procter fell over a Harris inswinger and was LBW for a carefully-compiled 26. Alex Wakely edged Harris behind for 18 just after lunch following another handy stand of 58. 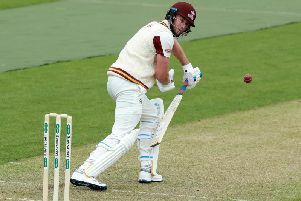 Levi joined Vasconcelos and the pair moved Northants into a strong position at 210 for three with Levi, returning from a quad injury, beginning to play with authority. But a miscued pull found mid-on and Levi fell for 41 just when poised to take the afternoon away from Middlesex. The visitors remained in the game and the wicket of Vasconcelos came just before the second-new ball was due and saw a fightback from 273 for four to 312 for eight. Murtagh trapped Steven Crook LBW for 31 before Harris struck twice in two balls, bowling Rory Kleinveldt for seven and having Nathan Buck caught behind. Harris finish the day with figures of five for 81 - his third five-wicket haul of the summer. And the Middlesex man said: “It’s always nice to get some wickets but I feel disappointed we haven’t bowled them out in the day. “It’s tough coming off the back of a block of white-ball cricket and we needed to be a little quicker on the ball this morning than we were.